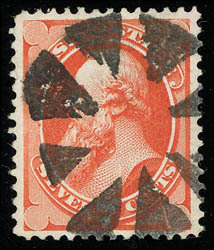 Circle of Wedges, remarkable bold strike on well centered 7¢ orange vermilion (160), radiant color on bright paper, an Extremely Fine gem, Illustrated in Weiss on page 258. Weiss No. TR-W13 Estimate $200 - 300. A link back to Sale 74 - Lot 2011, along with its description, will be appended to your message.